If you’re looking to rev up your exercise routine or for those of you who feel you do not have time to work-out there is a growing body of excellent scientific research showing that you can perform significantly shorter workouts at greater intensities and get better results than the usual time consuming ‘cardio’ type routines. Called High Intensity Interval Training or HIIT for short, these intense bursts of all out exercise last for about 30 seconds; the emphasis being the “all out” bit so the rest periods of 90 seconds have to be very easy to allow recovery. An example would be 30 seconds of sprinting followed by 90 seconds of walking. You then repeat the cycle for a total of eight repetitions. Your total time invested in a mere 20 minutes and that includes a three-minute warm up and two-minute cool down. Doing just one session of this type of workout a week will really help get you to your goal of improved health and weight loss. Just by practicing interval training once a week you can take advantage of numerous benefits from more efficient and effective intake of oxygen to experiencing a slower heart rate. By doing this, your cardiovascular system gets stressed and you build up lactic acid in your muscles which boosts the bodies fuel, strength and stamina then in recovery you allow yourself to prepare for the next interval. Evidence has shown that high-intensity interval training increases aerobic capacity (the body’s ability to use oxygen for energy) increases higher than those who just do continuous exercise. These high-intensity exercises engage type II muscle fibers that you cannot engage through low intensity ‘cardio’. The more oxygen your body converts to energy the faster and stronger your body becomes. When you engage these muscle fibers you cause a cascade of positive health benefits including improved fat burning. You will also boost your body’s natural production of human growth hormone (HGH or somatotropin) which is a key to repairing damage to tissues and build muscles. This vital hormone is responsible for physical strength, health and longevity. Interval training has every day applications as they are similar to regular activities we perform daily and training this way prepares your body for the sudden bursts of activity or stress that everyone experiences daily. 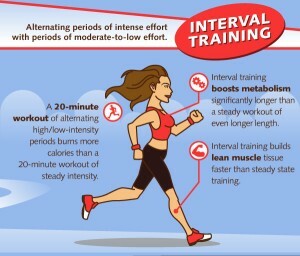 If you want to lose fat fast, interval training is the key. It’s more fun and more effective than boring ‘cardio’ and you get better results in less time helping you to reach your fat loss and fitness goals quicker. Another added benefit is that Interval training is also the perfect way to train for any other sport.